Agedashi tofu really hit the spot during this freezing cold winter. It is a delicate comfort food, with deep fried tofu in a dashi-mirin-soy broth. I love the various textures in this recipe, it’s crunchy surface breaks way to silken tofu which absorbs the dashi sauce beautifully. It’s a pretty simple recipe, but a typical American kitchen might not have the dashi broth ingredients. But it is well worth putting in the effort to buy these basic ingredients, as it will allow you to make many more Japanese recipes with ease. You’ll need: 1 package soft tofu (but medium and firm will work well too), 1/2 cup corn starch, thinly sliced green onions, 1 1/2 cup dashi broth (water, bonito flakes, and kombu), 2T mirin, 2T soy sauce, 2 quarter sized slices of ginger (optional), ichimi togarashi (optional), 1 1/2 cup vegetable oil. First, drain the tofu, wrap in 4 paper towels, and sandwich between two plates to remove excess water. Now, combine dashi broth, mirin, soy sauce, and ginger and simmer for 20 minutes partially covered with lid. It’s okay to let the sauce reduce to 1 cup to concentrate the flavor a bit. Cut the tofu into 16 pieces (about 1.5 inch rectangles) and dredge in corn starch. 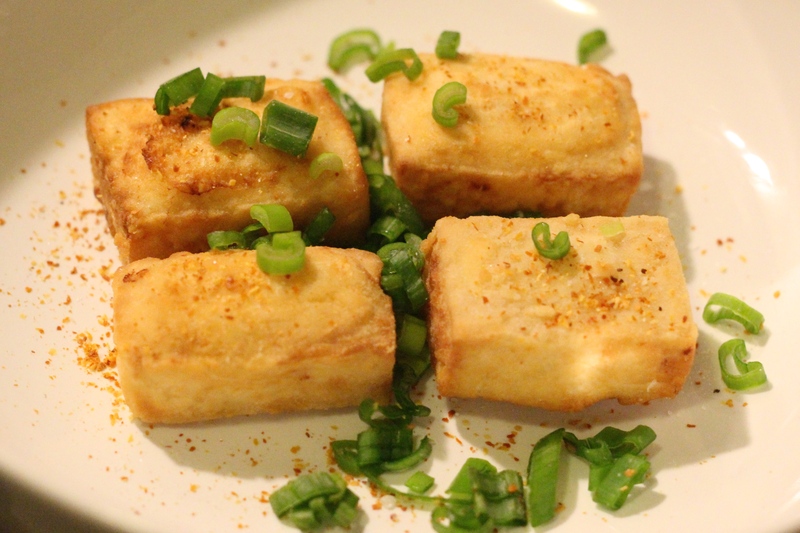 Deep fry tofu in vegetable oil for about 8-10 minutes, flipping over once. The color should resemble french fries. When done, plate 4 pieces each in a shallow bowl, cover with green onions and a bit of ichimi togarashi (for spice). Then ladle each serving over with 1/4 cup of the dashi-mirin-soy sauce. You must serve it immediately to get the full experience. Dipping the tofu repeatedly once the crust is bitten into is essential to get all the flavors incorporated.